"My head says go but my heart says no"
The Ten Meter Tower. You've never been up there before. Do you jump or do you go back down? A short documentary film by Maximilien Van Aertryck. This is very, very human. "What, sorry I'm not listening" at about 5:20 - me every time I've gone off the 10 meter. I would hate to be the guy who was picking his nose. Indeed, this is very, very human. I was watching thinking I would never, ever do this. And then about halfway through I remembered, I did do it, more than once, when I was much younger. Watching this I think I would so easily just jump off, no muss, no fuss. Which probably means I would be more like Mr Bean up there, lying spreadeagled on the platform begging for forgiveness. I'm terrified of heights, especially heights I can fall from (roller coasters, no problem). It's gotten worse with age, and I would never be able to get up to the top of the platform now, but I did jump when I was in my early teens. There was a platform built out in the middle of some southern Wisconsin lake, and we were there on a trip. There was a pretty solid line up to the ten meter dive, and I waited for probably fifteen minutes. On the way up, the kid in front of me was getting more and more nervous about it. When it was her turn, she started to freeze, and just couldn't do it. I was freaked out, and a little extra because she was freaking out. If she hadn't been so nervous, I probably would've been having her same reaction. Then, randomly, I started talking to her, trying to reassure her, saying it wouldn't be so bad. In the end, I told her to watch me, I would go first, and she could follow. Instead of being terrified, clutching onto the railing, and freaking out, there I was running off the platform, screaming out into nothingness. When I surfaced, I waved back, and she jumped. There's probably some sort of psychological effect to it, but I've found in situations like this, and other things that were actually life-threatening (small tour boat in an ocean with heavy seas), the more I focus on helping other deal with the exact same thing that's terrifying me, the more easily I can ignore my own fears. Somewhat related, I wonder if there was a relationship in the time it took between people who were up there alone compared to the pairs (couples?). I looked into this a bit more. I probably didn't jump off one that tall, since there are so few of them in the US Wikipedia has a list of them all. But whatever it was it seemed ... pretty high. Hold your nose. Do a cannonball. All over in a flash. And for the rest of your life you'll be able to brag, "Why yes, I've been off the 10 meter..."
This was just what I needed today: a reminder of the vast and irreducible commonality of humanity. Plus, that older woman who changes her mind. She's the hero I need. I can remember being in sixth grade and daring each other to jump off of the high dive. In my memory it is at least as high as the one in the video, but probably it was only half as high. There was no backing out when your friends are all on the ladder behind you, so I jumped, but I can still feel how scared I was. Having taken a very long time to jump off the top of a waterfall that was probably less high but with a much smaller safe landing zone than an indoor pool... I can relate to this very much. I did jump. It was not a mistake. It was 100% worth it. Now that acquaintance of mine that got fancy and went for a backflip and busted his leg open, probably not so much worth it, just don't be that guy. The only ten-meter jump in my state is at the Air Force Academy. I guess I'm off the hook, then. Whatever the "high-dive" was where I grew up was terrifying enough. Just checked, yep, was actually that tall. Jesus that was quite a summer. My heart says no, but my brain says hell no. The problem with the 10 meter is that while you're 10 meters above the surface of the water, you're staring down at a well-lit concrete tank with a bottom that's around 15 meters below you. That's five stories, and it's surprisingly easy to imagine what would happen if the water wasn't there. It's a lot easier to not look and take a running jump. New York City, 8 million people... NO 10 METER PLATFORM?! Jesus, don't tell the others. I think the more common "high dive" platform in the US is 7.5m. They are at least common enough that Wikipedia doesn't bother to have a list. I'm pretty sure that's the highest I've ever had access to at a pool, and it was plenty high. I always heard stated as fact that in Airborne School, the "scariest" element, in terms of having the highest spontaneous washout rate, is the 34-foot tower, and that it was specifically designed during WWII at a height that is in some way maximally unnerving for people to jump off of -- something having to do with being able to see the ground in enough detail to know how high up you are, and not be able to easily ignore it. I can't find any real evidence for that claim, although I did find this charming probably-wouldn't-pass-an-IRB 1950s study studying the effect of height on training washout rates. I always brag that I jumped from the 10m tower in Nassau. .....and I neglect to mention that it wasn't Nassau, Bahamas but Nassau, Germany which is a very small town on the even smaller river Lahn. I have a weird stair phobia. I can't quite narrow down specifically what triggers it, but the stairs up to the water slide in the pool do. The stairs in the Eiffel tower definitely do. (Thanks, cheapskate ex-girlfriend who refused to pay the fee for the lifts... thanks!). So if I managed to get up the top of the tower I think I would be happier jumping off than going back on to the stairs. Whatever the "high-dive" was where I grew up was terrifying enough. Remember the old "Pathetic Geek Stories" comic on the Onion's AV Club? People would send in their true stories of middle school humiliation and they'd be drawn up as 4 panel cartoons. One of mine is actually backing down and retreating from the high-dice at the local pool, about age 12, as the mob of adverse children mocked me and hooted with laughter. No problem. Just hold the British Prime Minister's hand. And never try a belly-flop from 5 or 10 meters. Trust me on this. I am terrified of heights and I am totally in love with Linus and Frida. Giant Nerd P.S. : 4:02 for anyone who is still wondering, after all these years, how to pronounce "Linux." I'm not scared of heights, per se, but I do get wicked vertigo. I went to a climbing centre recently with my son and they have clip and climb. You basically clip onto this rope attached to the ceiling, climb up and then jump off the wall and it lowers you down. The first 30 cm drop is all free fall though, so it's a bit of a jolt. I would race up the wall quite happily, get to the top, look down and get an enormous rush of vertigo. I'd lean back to let go and find that whichever of my hands was the last attached to the wall really struggled to let go. It was like a reflex grip that I had to focus on to let go. Crazy stuff. I totally get the same sort of reaction on diving boards. I always try to jump off the top board once when i'm in a pool with diving boards. Now that I see the paucity of 10m boards in the US i'm not convinced i've ever jumped of a 10m one. (i'm in the UK, so who knows how common they are here). The Commonwealth Pool in Edinburgh has one, so i'll maybe give that a shot if it's open to the public. Our little gang specialized in jumping, 50 ft was the preferred (and pretty much our maximum) height. Bridges, utility poles, cliffs. Obviously the depth was checked first. Tips: Feet first. Don't have your arms out, they go either up or down. Point your toes, don't go flat footed. Curl up or some such when landing, or you might go too deep and run out of breath coming up. Spotter at the bottom, typically in an inflatable raft. Yeah, your first jump is like these. The trick is to make it a routine, and just get back up and jump again as soon as you can, and keep repeating. That way you become acclimated and relaxed enough to enjoy the experience fully around the fifth jump or so. Looking down and seeing your reflection coming up is fun, also in nature, look around, the changing perspective of the landscape is impressive, the whole world is shifting. YES! I would do this. My nose might hate me immediately afterwards, but man, what a rush. I'm within 20 minutes of both the 10-meter platform in Maryland. I've never gone off of them (or even the one next-in height for that matter). I should probably take advantage of the rec-swim next time I go and just try it. I probably didn't jump off one that tall, since there are so few of them in the US Wikipedia has a list of them all. Huh. The only one in my state is just down the road from my office. This completely intimidates me, which of course means I should probably go and jump. Btw - never jump off a high dive when you have a sinus infection. More people would do it quicker if there were a slide at the top. They're great (especially Frida :-). A little correction to the translation: Linus doesn't say "see you in heaven", but rather "see you in Nangijala" which is Jonatan's last words to his little brother in The Brothers Lionheart. Really interesting choice to show the hyper masculine chest tattoo guy (I'm projecting a bit here) climbing down all the ladders. As if to really show what's involved in the climb down (literally and figuratively). I'd like it if they'd had a cutaway to the under water shot which then did not end in a jump. Like, as a tease. Because when they show the pool you know it's a Jump. People in my home state don't seem to have this particular anxiety. I too have many fond memories of nearly dying in various quarries, rivers, and lakes as a nihilistic and inebriated teenager. Hold your nose. Do a cannonball. All over in a flash. If you're gonna do that, clench. I do not understand high dives at all. Sort-of like how I do not understand skiing. I don't want to fall down a mountain faster and with less friction! I prefer not to fall down it at all! I have happily jumped from the rock at Waimea Bay, nearly as high, and a wonderful rush. Also shallower water. I am so proud of the "I don't have the guts" lady. You do! You do have the guts! I cheered when she jumped. The "Let's do this" girl at 1:33 is going to rule the world some day. I was staying in a huge block of flats a while ago. We were on some terrifically high floor . Outside there was a swimming pool. Going out on the balcony and looking down at the pool I had this constant constant thought of "If I jumped I could probably hit the pool". Every time I was there I felt like I was seconds away from jumping over. I got this feeling again watching this video (and writing this comment). Human response to high places is very very strange. I checked, it was the 17th Floor, which an online building height calculator tells me is 60 Meters. Also apparently the Golden Gate bridge is 66m high, so that's a useful proxy. 98% of people who jump from the Golden Gate Bridge do so fatally. Also that's into deep water, as opposed to a relatively shallow swimming pool. I also loved the "I don't have the guts" woman. Something about the way she said that phrase, full of self-recrimination and with fists clenched, and then paused forever on the stairs as she was backing down (I briefly thought that my video had stalled), and then came back up to conquer that dive once and for all, was so compelling. I felt like I was watching a scene from a foreign film from the early 60s. Her jump was the most exciting, though I found the whole film riveting. Linus's comment that "There's a hair tie down there" was excellent, too. Noticing the utterly mundane during times of stress is such a human thing to do. Jumping in to water from that height is one of those perfect moments in life where you can do a thing that your body and mind are telling you is deathly terrifying and, after having done it, you can refocus the whole way you calculate risk a little bit, and live a fuller life because of it. As humans we're constantly being bombarded by warnings from our brains about things we shouldn't do or things we should be afraid of, and it's important to be reminded from time to time that a lot of those messages are scrambled vestiges of our deep animal past that we'd be better off ignoring. Misperceived risk is going to destroy the human race eventually; would that more of us had had the chance to go off the high dive from time to time. This was a great film, thanks so much for sharing it. This is the best. 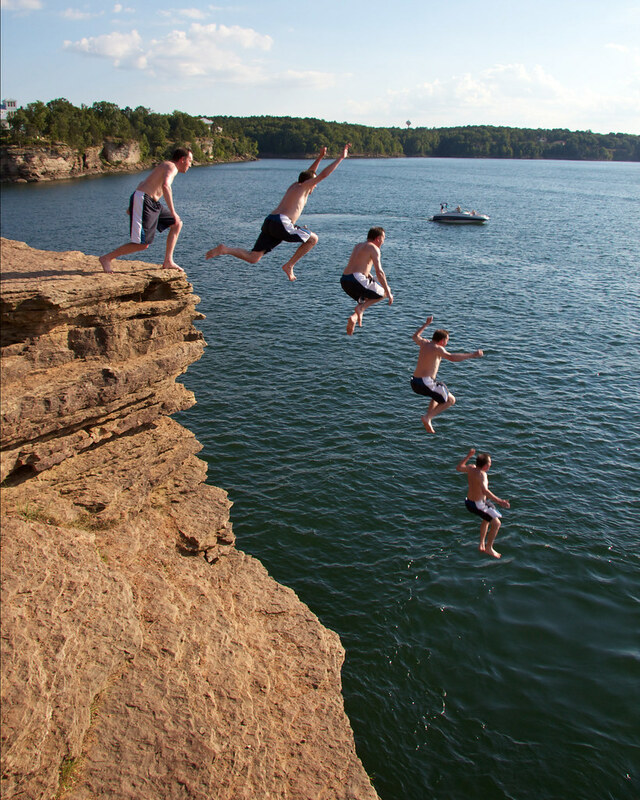 I grew up jumping off these cliffs into Greers Ferry Lake, and, to this day, one of my favorite things is taking people there for the first time and watching the clammy-handed hesitation (that, don't get me wrong, I still get!) when peoples' braggadocio catches up with them at the cliff's edge. Yes, the drop always looks easier from below than from above. My hint: look out, not down. The horizon is stable and seems comfortingly eye-level, unlike the gaping gulf underfoot. A few deep breaths, eyes out to the horizon, then jump! I was totally rooting for Linus and Frida! And the body language of the woman who hesitates on the ladder... that's the human condition in a nutshell. 98% of people who jump from the Golden Gate Bridge do so fatally. That may include the SF side of the bridge over land. The land you don't see until after you jump. Yeah, that'd be me. I'd want to not jump, but not nearly as bad as I'd want to not go back down that ladder, which is way, way to steep.